I got this project instrument a few weeks ago and just started working on it. 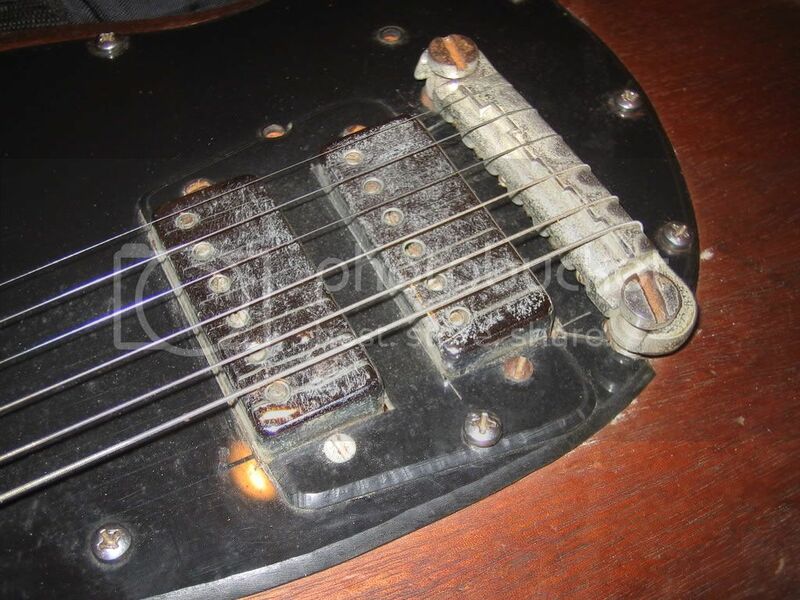 This poor Junior had two Les Paul baby humbuckers installed instead of the old dog-ear P-90 - though they were installed next to each other, so the neck joint wasn't cut into. Maybe the "junior scientest" working in this guitar was trying to simply enlarge the control cavity to add two more controls and a selector switch and they broke through the thin top of the SG - or maybe they just had a butter knife to work with and decided hacking a huge hole in the guitar was the easiest way to modify the guitar - anyway, the sad result was what you see below ! The major task obviously is plugging this massive hole and then rerouting the control cavity for two controls and an output jack. 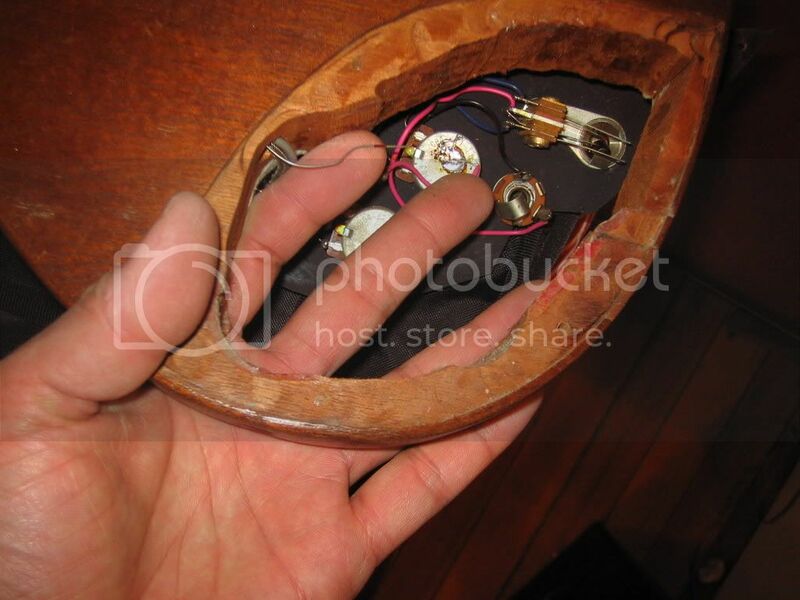 After that, the enlarged pickup routing will have to be filled and rerouted as well. On the plus side, the neck and heel of this Junior have never been broken and this guitar has the fat neck profile of the earliest Les Paul and SG Juniors. And the fretboard and frets are in good shape - well-played but still plenty of meat on them. To start with, I straightened out the edges of the hacked hole - and then I cut a large plug from a block of mahogany. 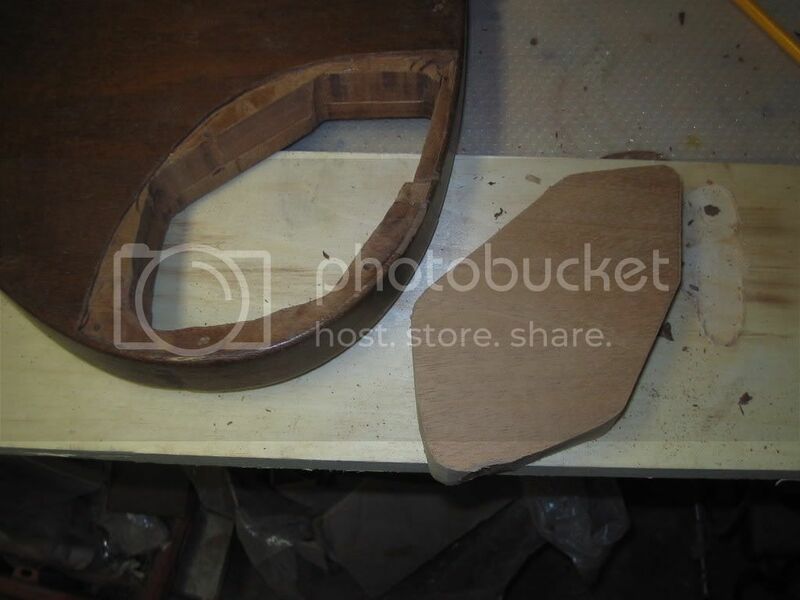 The block was then glued in using Titebond wood glue - with the top surface slightly above the rest of the guitar face to allow for some shrinkage of wood later. Once the block was glued in, I drilled in at three points to pin the plug with long maple dowels - securing the block in place. 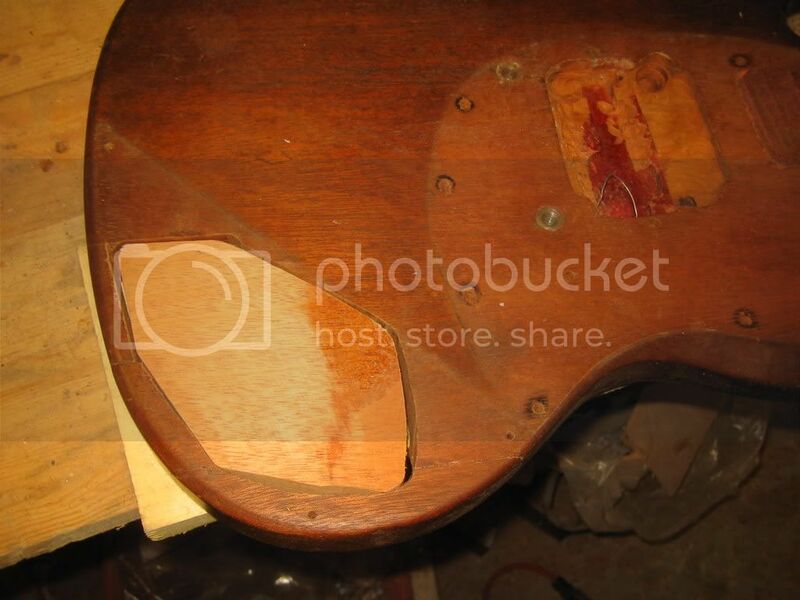 I repaired a 1964 SG (circa 1973) with similar problems - the owner had hacked a hole completely through the body to mount a Fender Jaguar tremolo.I used epoxy to glue the plug because it had better "fill" ability than white glue. For cosmetics, I glued 1/16 inch mahogany veneer on the front and back - the beveling on the SG body masked the join line. 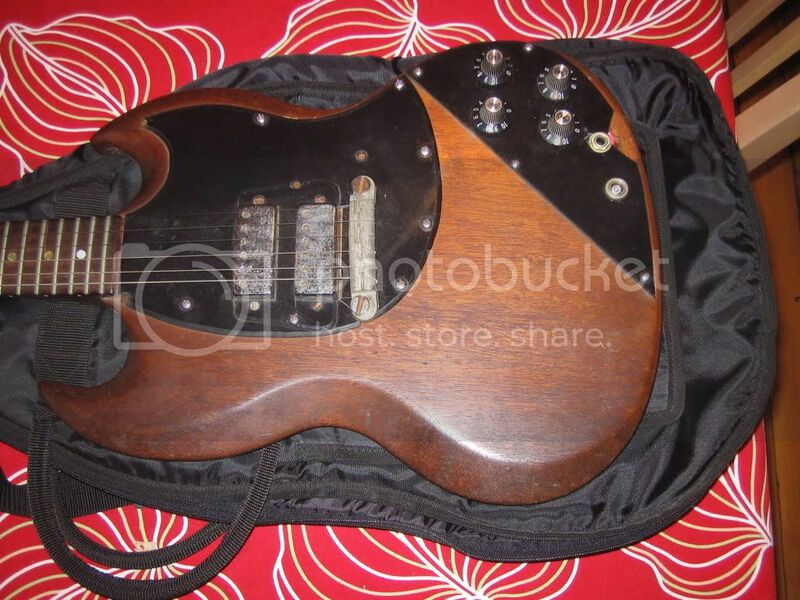 Hi, Do you have more pics on your work on the 1965 Gibson SG Junior I super interested in seeing the progress. Great work. I have finally restarted this effort and I will be posting an update to this project in the coming weeks once I have rerouted the pickup and control cavities. I'm probably going to refinish the guitar in an aged metallic Pelham Blue finish - keep your eyes out for the update and thanks for your interest! 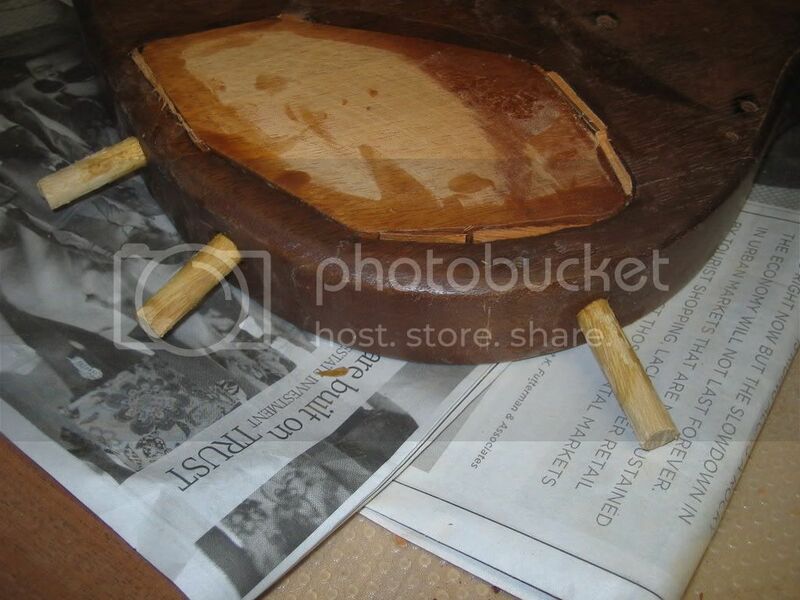 I'm refinishing the same model and would love to see your progress. Do you intend on posting more photos? To both Bob and Emmett - yes I do plan on posting more pictures, though I am going to respray the front and back of the body, since after sitting for well over a year, the seam lines for the body plug are now visible. The metallic paint seems to be particularly prone to high-lighting any seams.